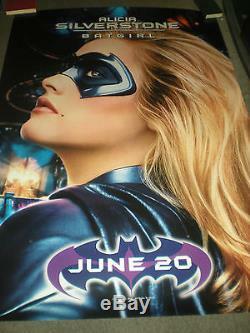 For sale is this original double-sided bus shelter poster of ALICIA SILVERSTONE as BATGIRL from BATMAN & ROBIN. The poster measures 48" x 69.5" and is in very good condition. The item "ALICIA SILVERSTONE BATGIRL ORIGINAL DOUBLE SIDED BUS SHELTER POSTER" is in sale since Friday, May 17, 2013. This item is in the category "Entertainment Memorabilia\Movie Memorabilia\Posters\Originals-United States\1990-99". The seller is "mr-bigscreen" and is located in Los Angeles, California. This item can be shipped to United States.